It is a beautiful day out today so I thought I would do more thinning and transplanting. 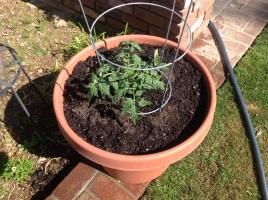 Today I planted 2 more Beefsteak Tomato plants. These should be ready to harvest in late May to mid April. I also planted more Rosemary and Greek Basil. These should both be ready for use in about a month as they are already very mature plants. This is the advantage of sowing seeds, indoors, early in the season!